The Women’s March https://www.womensmarch.com on the day following President Trump’s Inauguration was a grassroots movement that brought millions into the streets. They marched in Washington D.C and in cities large and small across the nation (and around the world). They marched with the message that ours is a nation of inclusion and that the moral health of our nation is measured by how we treat one another, particularly those who are most vulnerable. Each person who marched has their own story. Below in two installments is a reflection by my friend and pastoral colleague, Julie Flowers. I invite you to read and get involved. I looked at my suitcase, giving it one last check to make sure I had everything. Full raingear, ski pants, ski jacket, mittens, emergency rain ponchos, first aid kit, extra wool socks, portable phone charger, bandana, shirts with feminist messages on them – all there. Granola bars, water bottle, small bag to carry with me – also there. I looked by the door where things were piled up and ready to go. Large white foamcore board, markers, paints, and paintbrushes were all set. I was headed to the Women’s March on Washington, and I wanted to be prepared for anything. The next morning, following our 12 hour drive traffic-filled (all marchers!) to Maryland, my friend Elisabeth and I woke to an unseasonably warm day (I didn’t need any of my emergency supplies!) and headed out. We climbed into the hotel’s metro shuttle, already filled with other women of all ages, and it took us to the station, where we hopped on a train headed into D.C. 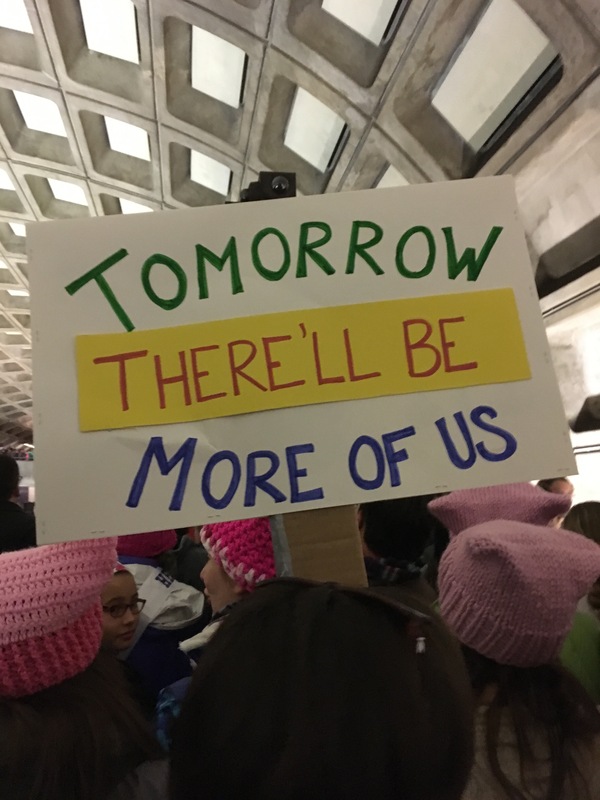 It was filled with women and men of all ages and from all over the country and of all races and with diverse stories – all headed to the March. systemic oppression, for the environment, for our children, for our public schools, and for peace and justice for all people. The metro stopped at Judiciary Square. Elisabeth and I got off, along with thousands of our closest friends. 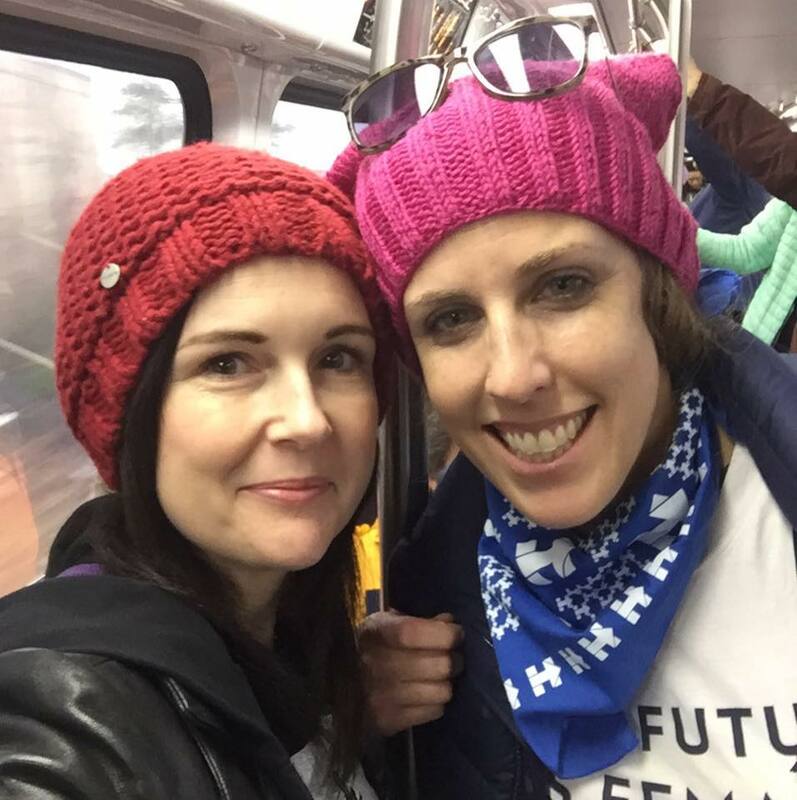 We could not do much more than get off, however – the metro platform outside the train was filled with those headed to the march. In both directions, along the platform and up the stairs toward street level, all we would see were other people, holding signs, linking arms, ready to stand up, ready to show the beautiful and diverse face of this nation to its new leader. We were ready to show the new administration what democracy looks like; ready to show the President that America’s diversity is her strength. A cheer suddenly rolled along the crowd as we waited to ascend into the light of day. Like a rumble of thunder coming over a plain, it started somewhere in the distance of that metro station and it roared over us, growing steadily as more voices joined in. People clapped. And cheered. We were ready. I looked ahead of me, and a sign carried by another woman caught my eye. “Tomorrow there’ll be more of us,” it read. Now, if you, like me, are a Hamilton fan http://www.hamiltonbroadway.com you will recognize that as a line from the song “The Story of Tonight.” I was struck by the poignant message – and by the promise – of that sign. It spoke of a movement, not just a moment (more Hamilton references!). It spoke of a commitment to stand up, to speak out, to fight for our planet and for its people, for our sisters and brothers, for our children, that would extend far beyond that one Saturday. “Raise a glass to freedom,” Hamilton and his friends sing in that song. “Something they can never take away no matter what they tell you.” Those words echoed in my head as we climbed the stairs toward the street level, following the woman carrying the sign. I felt tears well in my eyes as I felt the power and poignancy of that moment – that moment when I, along with millions of others all around the nation, were taking to the streets to insist that freedom is, indeed, something that can never be taken away; to insist that we the people are stronger than fear, stronger than hate, stronger than division, stronger than executive orders designed to turn back the clock and strip us of our rights. “Tomorrow there’ll be more of us,” I thought, as we stepped out, blinking, into the daylight. Installment 2: In Which We March to follow. “Tomorrow there’ll be more of us” …that just gave me chills. Yes, we’re stronger together and there’s a lot of work to do. Thank you for sharing your experience.